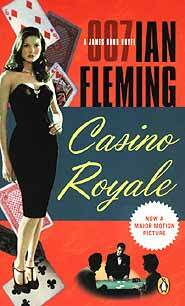 With yet another James Bond (Daniel Craig) and another James Bond movie (Casino Royale), Penguin books have seen the opportunity to re-release Ian Fleming’s Casino Royale in paperback (ISBN 0-14-303766-8). And having just seen the movie, I thought it would be interesting to see just how faithfully Broccoli’s movie followed the book, and to see just how well a book that was written 54 years ago would stack up today. The results were very interesting. The “new” less sophisticated Bond has deviated far from Ian Fleming’s original, and it should be remembered that Casino Royale was the first Bond book, setting the style of Commander Bond for the future. In Fleming’s book, our hero James Bond is not driving the latest Aston Martin, but in fact a pre-war blower Bentley, which would have been 20 years old at that time. The original James Bond obviously not as well off as his current celluloid counterpart! WWII was obviously still very much on people’s minds in the 1950s, and Russians and Communists were the protagonists. KGB and SMERSH being the baddies for the original Bond. Mr. Broccoli also did not really feel that the characterizations as penned by Ian Fleming were all that important either, with Le Chiffre being a fat 126 kg man in the book, and the secretary of a communist workers union, while in the movie he has slimmed down to a mere 85 kg and was the banker for the world’s terrorists. The movie also began with the exciting scenes in Madagascar, with Bond chasing someone from a terrorist organization, leaping from scaffolding and overhead cranes, in the new pseudo-sport called ‘parkour’. However, this was a figment of someone else’s imagination, as it certainly was not Ian Fleming’s! Parkour having become an entity only in the past five years. In addition, the book’s Casino Royale narcissistic Bond was much too suave and blasé to be doing such physical pursuits, and the book actually opens with Bond already at the casino playing roulette! You can search the book from cover to cover as well, and you will not find Vesper and Bond drinking Chateau Angelus wine on the train to the casino. Wine? Train? There was none of that, no Chateau Angelus, no train, and no adherence to the Fleming book. Even the central part of the book and the film do not follow each other, where they are playing cards in the Casino Royale. In the book, Bond is playing baccarat with Le Chiffre, but in the movie this was replaced with the modern high-stakes card game of Texas Hold ‘Em. However, you will be pleased to know that both in the book and in the movie, Vesper the double agent, gets her just desserts - but yet again, in a totally different fashion. I believe the book has passed the test of time, even though it is very obviously dated. Who has ever heard of a radio salesman? However, Ian Fleming’s attention to detail is enough to keep you involved. At B. 350 it is inexpensive, but your copy won’t last. The paper stock is woeful! 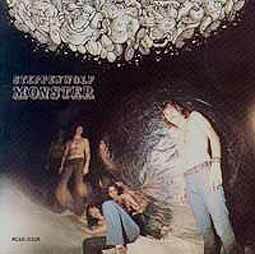 After inventing the heavy metal tag in the Bikers Anthem “Born To Be Wild” and flying the anti-drug cause in “The Pusher”, John Kay and the boys turned their attention on the anti war campaign with their smash hit album “Monster”. Coming out during America’s involvement in the Vietnam War this group of songs proved very popular with the youth of America with it’s stance against the military war machine, and is as relevant now as it was in 1970. But casting aside all political intentions of this group of songs (Steppenwolf’s credibility later thrown into contrast with albums such as “For Ladies Only” and Steppenwolf at your birthday party), the musical ability and the arrangements shown on these songs are glaringly apparent from the opening chords of the Trilogy Monster/Suicide/America slipping from country rock into heavy metal bluster at the twinkling of an eye with its built for stadium choruses and cutting lyrics. The strong guitar work of Larry Byrom and Goldie McJohns keyboard work in particular stand out supporting John Kay’s rants. The band also gets a chance to shine during the album’s only instrumental “Fag” which is a slide guitar/piano workout which comes in welcome contrast to some of this album’s heavier vocal songs. That is not to say that all of the songs hit the spot. They do with “Draft Resister” - certainly being this Dog’s rallying call if somebody wanted to cart him off to be shot at (especially against cats). My two big complaints though are against the record company. In the days of vinyl, 33 minutes is plainly not long enough. Could they not have doubled it up with Steppenwolf 7 (an album of equal length) to make one CD or found some out takes or live versions? My second major quibble is the transfer of Monster onto C.D. This is appalling. Removing all the pomp and majesty of the original, this power package deserves far more.